So far, I only have one Ringo biography in my Beatles library, Alan Clayson's "Ringo Starr: Straight man or joker ?" from 1991, so I guess it's about time we had another! Also, it's out in time for Ringo's 75th birthday this summer. 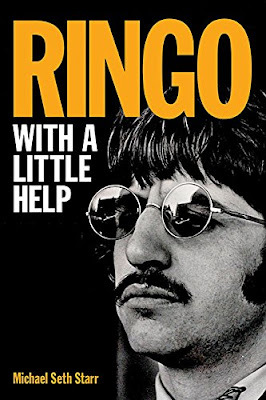 By the appropriately named Michael Seth Starr, a veteran celebrity biographer who's also the TV editor of the New York Post, "Ringo:With a Little Help" is the title of the new book, published by Backbeat Books in a hardcover. Michael Seth Starr: "Ringo:With A Little Help"
I have Clayson's book and don't hold it in very high regard. By and large it is, as R G Collingwood would term it, a prime example of 'cut and paste' history by a workmanlike writer who couldn't make his mind up about any aspect of Ringo's life and career but found space to expound on his own tiresome theories which crop up again and again in his increasingly weak output. The main obsession is that somehow the Beatles were lucky (which presumably makes him feel better about his own failed career as a musician). I don't think there was much I found out other than it saved me reading through a pile of 1970s NMEs and the like. But will this be any better? The question is, as someone who works as a historian, which additional sources is he going to draw upon? Nearly all the main witnesses are either dead or refuse to submit to any more interviews. It might shed some light on Ringo's post Beatles career, particularly the life of excess from the early 70s onwards, but I suspect it will be more cut and paste. The thing that will almost certainly stop me from buying it until I get get it for a few pounds in 10 years time, is that no American writer, even the talented ones such as Schaffner, really get or understand British culture and life and I suspect I wouldn't be able to face yet another painful account of a Beatles early life. Well, Ringo's story from pre birth to 1962 has already been told by Lewisohn, so that's taken care of. Any ex-Beatle biography should also concentrate more on the post-Beatles era and just briefly retell the Beatles era stuff as a preamble. Which I agree with, Roger, but the blurb makes it quite clear that it is going to start with his sickly childhood, poverty and patchy school record. Incidentally, I full of admiration for Lewishom's work which will stand as a genuinely authoritative historical account, but even the expanded version still cuts corners. For example there is an aspect of Ringo's early life, the exact relationship with his estranged father, which he has never fully told and Lewishom's account adds little to what is already known (principally because he had to rely on all secondary sources and previously published accounts. Is it likely this book will add any information? But if it manages to cover the bases of the tax exile jet-setting years and those disco albums then I might get round to reading it one day.